Harjinder Kler is with HUTAN – Kinabatangan Orang-utan Conservation Programme (KOCP), which is a community-based research and conservation Non-Governmental Organisation (NGO); based in the village of Sukau, along the Kinabatangan river in Sabah, Malaysian Borneo. Within her capacity at HUTAN - KOCP, Harjinder engages with Government agencies, NGOs, universities, funders and the oil palm sector (via the Roundtable for Sustainable Palm Oil). She has also given presentations in the United States, United Kingdom, Myanmar and Malaysia; focusing on Sabah’s wildlife and palm oil issues. 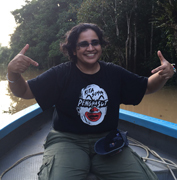 She did her undergraduate degree in Parks & Recreation at Lincoln University in New Zealand and prior to working with HUTAN – KOCP since 2008, Harjinder was a journalist based in Sabah before joining the NGOs fraternity with WWF-Malaysia. Harjinder believes that we can all help do better for communities and the environment while still being economically progressive.